On Saturday 26th May 1990, the townspeople of Risquons-Tout, Ville de Mouscron, paid tribute to officers and men of the B.E.F. who were killed between the 25th and 27th May 1940 in an action which embodied qualities of courage and self sacrifice of the highest degrees. Soldiers holding defensive positions in the area, which is on the Franco-Belgian border, during the retreat to Dunkirk were members of five regiments, namely:- The East Surrey Regiment, The Buffs, The Bedfordshire and Hertfordshire Regiment, The Lancashire Fusiliers and The Middlesex Regiment. A determined attack on the enemy by a bren-gun carrier, manned by three privates from The East Surrey Regiment, was at first successful but the vehicle was later knocked out by an anti-tank gun and its occupants killed. Other troops continued to fight gallantly but they were eventually overwhelmed, many being wounded and twelve being killed. Of the latter six were identified as being from The East Surreys, namely:- Major Rowland Frederick Duncombe Anderson, WOII Horace Gibson, Pte. Edward Scott Bailey, Pte. Charles Frederick Langley, Pte Horace Douglas Roberts and Pte. Brian John Waring. There were other unidentified casualties who were also believed to belong to the Regiment. The driver of the carrier was Private Brian Waring aged 21 and one of the crew was Private Horace Roberts aged 19. All three members of the bren-gun carrier crew were first buried in Risquons-Tout Cemetery but were later re-interred at the Harverlee Military Cemetery. 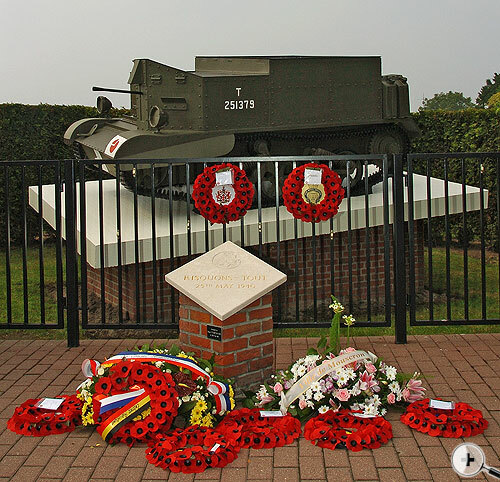 At the memorial service a bren-gun carrier (symbolic of the high point of the historic action) was unveiled by M. Detremmerie, the local Mayor. A plaque was unveiled recording the gallantry of the crew and the 1st/6th Bn. The East Surrey Regiment (TA). A service of remembrance is held annually in May and on Remembrance Day.